As one of the world’s most vibrant cities, London’s innate dynamism means that the metropolis is in an almost continuous state of change. According to the Office for National Statistics, the population of the British capital has grown by more than 12 per cent in just ten years. This increase in population has also meant a rise in cultural diversity and in the creation or transformation of new areas in the city. When it comes to transformation, few London areas have undergone changes that are as significant as those that East London has experienced. In this article we look briefly at the history of East London and then examine how the recent regeneration projects that have taken place in the area have affected its economy and its inhabitants. The history of East London is inevitably linked to London’s port and its docks, as they were for several centuries a trading hub. East London experienced a notable expansion during the 19th century, when the railway reached Stratford and linked it with the docks, Custom House, and Woolwich. The railway infrastructure was damaged during the Second World War, and although they were once part of the world’s largest port, the London docks experienced a sharp decline in activity between the 1960s and the 1980s. The closure of the docks severely affected the economic and social make-up of East London, and what had previously been a thriving area became stricken with unemployment, poverty, racial tension, and crime. The population went from almost 600,000 at the turn of the 20th century to barely 140,000 in 1981. The Docklands Light Railway (DLR) has been one of the most significant regeneration projects that have taken place in East London. This public transport network was inaugurated in August 1987 and since then it has been extended in several occasions, connecting an increasing number of East London neighbourhoods and providing a convenient public transport option to almost 90 million passengers every year. Prior to the completion of this project, large parts of East London had been dependent on bus transportation only, as the planned underground extensions of the Jubilee Line never took place.This project is worth mentioning too as it was completed in a record time of less than two years. Today, the DLR network has 45 stations across East London and runs for more than 25 miles. Currently, the system has 6 lines and serves key locations in East London, like Stratford, London City airport, Canary Wharf, and Woolwich. It could be said that the construction of the London City airport was a natural consequence of the various regeneration projects that turned Canary Wharf and the adjacent areas into major financial districts. The airport was inaugurated in 1987, shortly after the DLR began to run, and it now serves 3 million passengers per year, most of which are business people who choose to fly into this airport due to its proximity to the capital’s financial district. The airport is served by the major European airlines and has connections with Frankfurt, Zurich, New York, Barcelona, Paris, Amsterdam, and Dublin. The London Thames Gateway is a comprehensive regeneration initiative that began to be developed in 2003, with the objective of facilitating economic growth in an area that is home to 1.6 million people. The project encompasses and area of over 40 miles along the eastern side of the Thames Estuary, which had been brownfield land for several decades. This projects focusses on several aspects, including the construction of residential apartment blocks, the improvement of public transport and other public infrastructure such as parks, hospitals, and shopping areas, support in the development of sustainable technologies, the creation of local jobs, and the promotion of East London as a prime tourist destination. All in all, the London Thames Gateway project aims to bring together the public and private sectors in transforming East London into a competitive area with high quality of life standards. 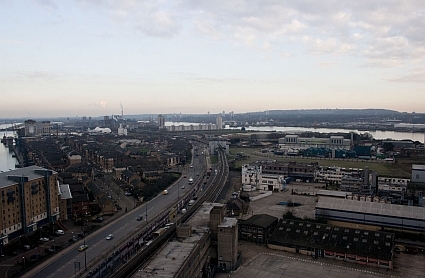 After the docks closure in the 1980s and the subsequent rise in unemployment and deprivation, the government designated this area as an enterprise zone and created the London Docklands Development Corporation in order to promote regeneration in the area. Investors were attracted to this previously derelict area thanks to incentives like tax exemption schemes, and by the end of 1990s the area was virtually unrecognisable, as it had gone from wasteland to top-class business and residential facilities. With its improved transport links and modern infrastructure, the Docks is now considered a prime business area. The impact of these regeneration initiatives has played a crucial role in the transformation of East London. As new projects are drafted and approved, we can only expect that this vibrant area of the capital will continue to evolve and to look forward to future developments.